NAWAB SHAFATH ALI KHAN MAN-EATERS AND WILDLIFE CHALLENGES.. 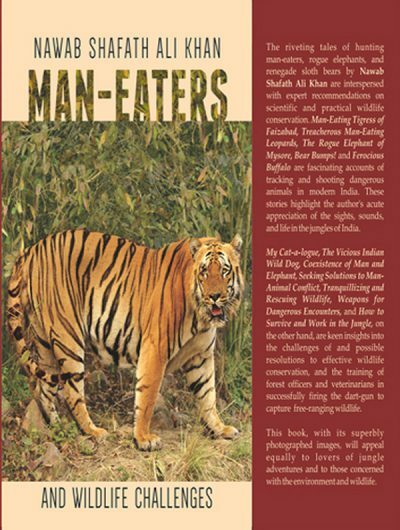 The riveting tales of hunting man-eaters, rogue elephants, and renegade sloth bears by Nawab Shafath Ali Khan are interspersed with expert recommendation on scientific and practical wildlife conservation. Man-eating tigress of Faizabad, Treacherous Man-Eating Leopards, The Rogue Elephant of Mysore, Bear Buttmps! And Ferocious Buffalo are fascinating accounts of tracking and shooting dangerous animals in modern India. These stories highlight the author’s acute appreciation of the sights, sounds,and life in the jungles of India. 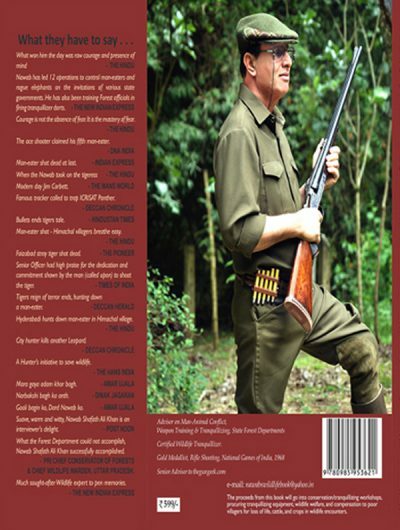 My Cat-a-logue, The Vicious Indian Wild Dog, Coexistence to Man-Animal Conflict, Tranquilizing and Rescuing Encounters, and How to Survive and Work in the Jungle, on the other hand, are Keen insights into the challenges of and possible resolution, and the training of forest officers and veterinarians in successfully firing the dart-gun to capture free-ranging Wildlife. This book, with its superbly photographed images, will appeal equally to lovers of jungle adventures and to those concerned with the environment and wildlife. Probably the only professional / licensed hunter in India, he deals with the present day crises on tiger conservation. Having lived in the jung les of South India for most of his life he deals in considerable detail, the reasons on the Indian fauna, in particular the tiger being driven to the verge of extinction, based on his field studies. As a former National Champion in Rifle shooting, he is using his expertise in training forest personal across the country in accurate darting of wild animals. He has been authorised by the government of Andhra Pradesh (Forest department) in rescue of wild animals by tranquilizing them.